We have an amazing course on offer for Easter 2019, with classes for all levels – spanning four days, seven hours per day. For our grand finale, the guest artists will perform at The Tabernacle in Notting Hill in the evening of the final day of the course. This will also be an opportunity for those who complete a Bulerías course to perform their choreographies on stage! Each class will learn an original choreography suitable for its level. Beginners by Nuria García, Improvers & Elementary by Beatriz Morales, and Intermediate & Advanced by Adela Campallo. These short, fast dances are full of character and fun. All levels taught by Beatriz Morales. Each class is 1 hour. These classes will improve your speed and style. Level I is taught by Nuria García and Level II / III by Adela Campallo. Each class is 1 hour. Learn the beautiful style and technique of the distinctive long Bata de Cola skirt. Note: this class is for Intermediate Level and above and you must have your own bata. This class is taught by Beatriz Morales for 1 hour each day. Learn the art of playing the cajón! This course is aimed at giving you a better understanding of flamenco rhythm and to learn the art of playing the flamenco drum. 1 hour each day with Demi García Sabat. Develop your understanding and appreciation of flamenco cante. Each class is 2 hours and is taught by Jasmine Villalobos. 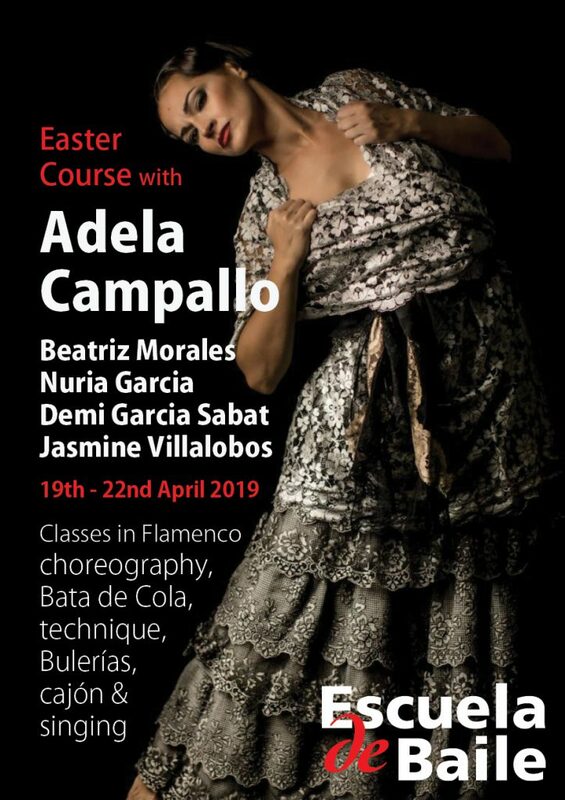 Adela Campallo is one of the most important figures in flamenco today, known for her flamenco puro style and simplicity. She made her flamenco dance debut at 9 years old and began with masters, Jose Galvan and Manolo Marin in Seville. She continued to perfect her art and personal style with Eva La Yerbabuena, Antonio Canales, Javier Baron, Adrian Galia, Manolete & Rafael Campallo. She has worked with the most notable flamenco artists including Farruquito, Andres Marin and Javier Latorre. She has performed in the Bienal de Sevila, Festival de Jerez, Albuquerque, Bogota and Original Flamenco Festival de Madrid. She has worked with her brother Rafael Campallo on “Puente de Triana”. She has toured Europe, Mexico and Japan. Beatriz comes to us from Jerez where she received her teaching qualification. She has studied with many top teachers including Belén Maya and Mercedes Ruiz. She is currently working with Antonio ‘El Pipa’. Head of Escuela de Baile, Nuria has danced with top flamenco companies and has taught all over the world. Her work with new students is astounding. Originally from Barcelona, Demi studied at the London College of Music. He now works as a freelance drummer and percussionist, specialising in Flamenco, Jazz, Arabic, Latin and Pop music. From La Linea, Andalucía. From an early age Jasmine discovered that she was able to follow different rhythms (compás) in Flamenco music and dance and also learnt various styles (palos) of the music. She has been singing professionally for many years in theatres, festivals and peñas through Europe. 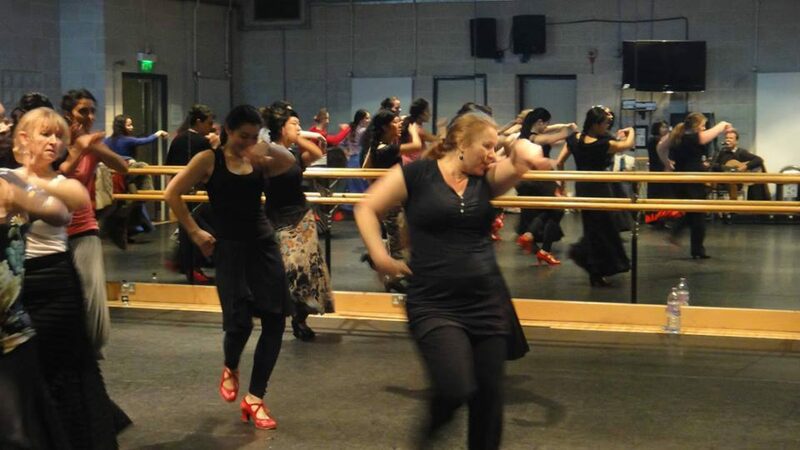 Return your form with course fees to Escuela de Baile, 35 Tintagel Drive, Stanmore, Middlesex HA7 4SR. Please make cheques payable to Escuela de Baile. You will receive an email confirmation. The course is extremely popular and only prompt booking can ensure the course of your choice. Please phone if you are unsure of your level or email us at info@ledb.co.uk. More information about Escuela de Baile is available on this website or call 020 8905 4554. If you are unable to attend the course please inform us immediately. If we cannot re-allocate your place we will be unable to refund your course fee. Escuela de Baile reserves the right to provide alternative teachers where strictly necessary. The booking form can be downloaded here. (You might need Adobe’s Acrobat Reader to view the PDF file. It can be obtained from the Adobe website.) For more information contact us. Join us on stage after the course! We have hired The Tabernacle, a Grade II listed building in Powis Square, Notting Hill, London, on the Easter Monday. Here we will host an amazing evening of flamenco with professionals Adela Campallo, Beatriz Morales, David Vargas, Tito Heredia, Jasmine Villalobos and Demi Garcia. More about the show here.